I've been looking foward to seeing a particular movie since last June. The trailer was on Miss Potter (which is a good film.) I especially liked Miss Potter because Daniel's Mommy really likes Beatrix Potter and the movie reminded me of her. Anyhow, Dan and I went to New Orleans last November for a relaxing weekend in the French Quarter. Here's some photos from that adventure. This is the room we stayed in. There is an orb in the picture. Spooky French Quarter. It was the coolest room at Place D' arms. It had a huge bathtub. Some of you may know about my current bathtub situation, so this tub time was a treat. We also went on a tour of the Cemetery where the voodoo queen Marie Laveau is burried. 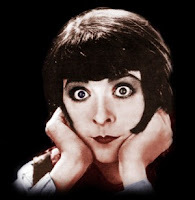 My point in bringing up our New Orleans rondevu is that we were able to see the film, Two Days in Paris. I loved it. And glory be, this movie was one of the trailers. 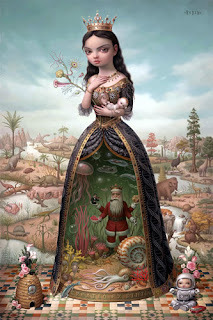 If you loved Amelie and enjoy Mark Rydens paintings, you'll like this light hearted fairytale. It was a fun treat. I would love to take the Young Women in my ward to it. You leave the theater feeling a bit better about who you are. I also left the theater wanting Penelope's wardrobe. TOO CUTE. 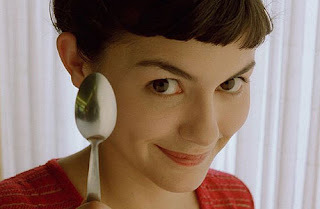 We all love Amelie. Audrey Tautou is too adorable. Dan and I saw an exhibit of Mark Rydens paintings at the Frye Art Museum in Seattle. I love the use of color and detail. They are really interesting to look at because you see things that are so unexpected. 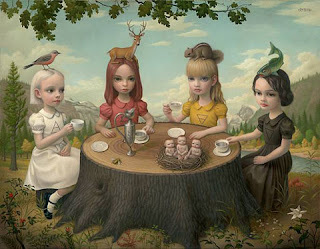 I think the most detail that is Mark Ryden like was in Penelopes room. I wish I could live in that room. All she needed was a pair of roller skates to roll around on.